OTTAWA -- Helping the Ottawa Senators end a five-game losing streak was just as sweet as posting his first shutout of the season for Anders Nilsson. 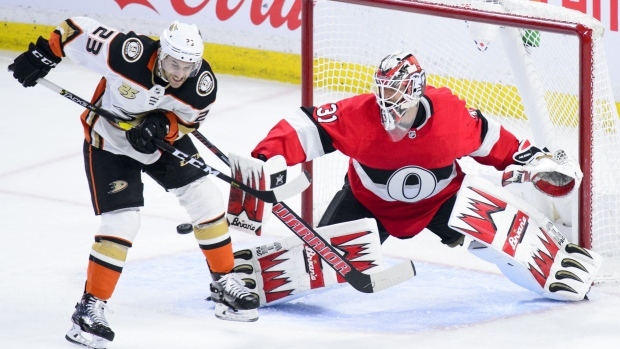 Nilsson stopped 45 shots as Ottawa defeated the Anaheim Ducks 4-0 Thursday night. It was Nilsson's fifth career shutout and first as a member of the Senators. "The shutout was a bonus," said Nilsson. "It was great to get back to winning again. Think it was great for the whole team to snap this losing streak." Matt Duchene led the way with two goals for Ottawa (20-29-5). Brady Tkachuk and Mark Stone also scored, while Chris Tierney added two assists. Sitting last in the standings, the Senators were happy to take advantage of a team who's having its own struggles. The Ducks (21-25-9) have now lost six straight and are 2-14-4 since Dec. 17. Thursday's game was the fourth of a five-game road trip ending Saturday in Philadelphia. John Gibson turning aside 19-of-21 shots in two periods of play but did not return for the third with an apparent injury. Chad Johnson stopped 9-of-10 shots in relief. Gibson had been pulled from the three previous Ducks games. Randy Carlyle felt his team had a number of chances, but at the same time still failed to play well enough defensively. Anaheim outshot Ottawa 17-8 in the first period, but just couldn't find a way to beat Nilsson. "There's been no reward for any of the work that we've put in," said Carlyle. "That's the confidence issue. You've got to try and build your people up and stay focused on the simple things and try to provide them with two things that they can focus on and build on and there's lots of positives in (Thursday's) game, but the big negative is we lost." Despite the struggles the Ducks refuse to feel sorry for themselves. Forward Adam Henrique said his team has to find a way to be difference makers together. "The details of our game aren't strong enough to win 1-0 right now," he said. "Night in, night out it's tough, but the only way out of it is together." The Senators were playing the second half of a back-to-back after losing 5-4 to the Toronto Maple Leafs, but a first period goal by Tkachuk gave them the confidence and edge they needed. After going scoreless through the last five games, Stone picked up his 23rd of the season, beating Gibson through traffic to take a 3-0 lead and Duchene added an empty-net goal. Nilsson was most impressive late in the third period with the Ducks on the power play and Gibson on the bench for a two-man advantage as he made a number of big stops to preserve the shutout. "I felt pretty comfortable even though I think I had more than a few lucky bounces and a few lucky breaks," said Nilsson. After being outshot in the first period, the Senators turned the tables and outshot the Ducks 16-9 and were able to take a 2-0 lead. Ottawa looked like it had a sure power-play goal early in the period, but Brandon Montour bailed out Gibson clearing a puck across the goal-line. Duchene made no mistake late in the period as he took a pass from Chris Tierney and fought his way to the net where he picked the top corner for his 23rd. Thomas Chabot became just the fourth Senators defenceman to have a season of ten-plus goals and 30-plus assists with an assist on Duchene's goal. This was the final meeting between the two teams with the Senators sweeping the season series. Notes: Ottawa's Ben Harpur was a healthy scratch. ... Cody Goloubef made his Senators debut, while Christian Jaros missed his second game with a lower body injury. ... The Ducks were without Patrick Eaves.